One owner fuel efficient power catamaran. The combination of significant weight saving, slender hulls, horizontal drives and huge under-wing clearance provides fuel burns that are 1/3 that of similarly sized monohulls, incredibly maneuverable and a soft ride. Built for long range cruising. Efficient solar and electrical system needing no marina stops until it's time to fuel up. There is no Power Cat available that is designed to perform as this custom Maine Cat, let us convince you today! West Florida Yachts would love to guide you through a personal showing of this 47' Maine Cat Power Catamaran Flybridge 2009. 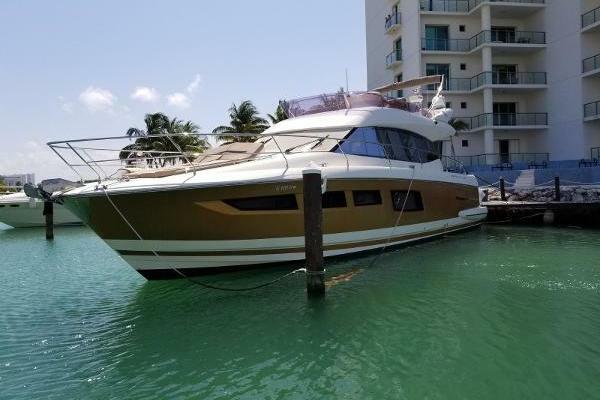 This yacht for sale is located in Fort Lauderdale, Florida and priced at $529,000. For a showing please contact us by filling out the form on this page and we will get back to you shortly! Following and highlighted in "bold" are some of the Important upgrades representing a few of many this owner incorporated in his Maine Cat P47. Note: This Maine Cat was finished and went into service in late 2010 as the owner wanted the later technology incorporated into several areas of this Power Cat. Hanging locker forward with aluminum access hatch to interior area of the crash bulkhead space, large storage area forward of hanging clothes. Locker is lighted and has a fan for ventilation. Aft of the stateroom is a passageway with pantry, cabinet and shelf storage; four steps up to the salon. Aft of the passageway is the guest head. Stainless steel hand rails on cabin top and cabin sides. Large cockpit with molded in boarding/swim platforms port and starboard containing hand rails, recessed swim ladders and recessed cleats. AB Navigo 12' LOA tender with Yamaha 25 hp 2 stroke outboard, total weight 350 Lbs. Custom window curtains of Sunbrella fabric, lined with tracks that fit above window trim. Tier 3 engines refer to the mandated required Marine Diesel engines after the 2013 production year.These engines assure less noise, vibration and improved economy through better atomization of the fuel. The Maine Cat is full displacement and will run flat at any speed. There is no squatting and no vibration. It is very quiet at the helm at all speeds. 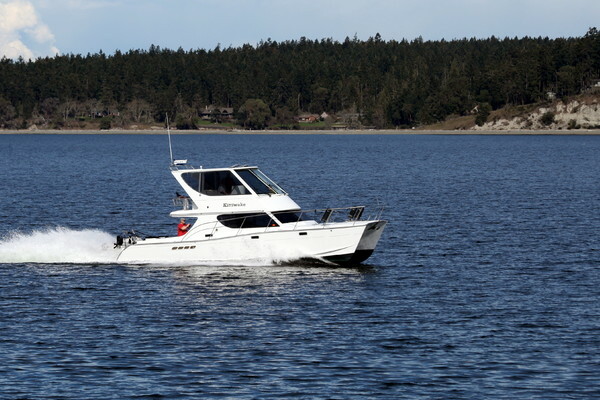 Many sailors will purchase a trawler as they transition from sail to power boating. This power catamaran is more efficient, faster, more stable and has less draft than a trawler. Outrun a storm with 20 kt capability. Anchor close in at anchorages because of 2 ft 10 inch draft. Won't roll as much on beam seas and doesn't need stabilizers. Enjoy the wide, flat forward deck, which is steeply pitched and cluttered on a trawler.